The family are said to be confident that Jonsson, a 41-year-old father of two, is alive in Ireland, but may no longer be in Dublin. Jonsson was in Dublin with his fiance to take part in a poker tournament. He left the Bonnington Hotel at 11:05am and was caught on CCTV at McGettigan’s bar two minutes later, exiting onto the Swords Road heading northbound past Highfield Hospital. There has been no trace of Jonson since. Ireland's Civil Defence has since gotten involved. The family said there were no signs of unusual behaviour prior to his disappearance. The family continue their efforts at trying to locate Jonsson with their ‘Have You Seen My Brother’ campaign. His disappearance comes just months after the owner of a popular sportsbook and online poker site 5Dimes went missing outside of San Jose, Costa Rica back in September of last year. Close to a dozen individuals were arrested and charged with Creighton's abduction, however, the American transplant has yet to be located. Some of Creighton's captors were apprehended in Spain. His case drew worldwide attention via extensive Web coverage by sites such as Gambling911.com, with a scope reaching far beyond the region where he was last seen. The family of Jonsson hope to draw attention beyond Dublin, and even outside of Ireland. 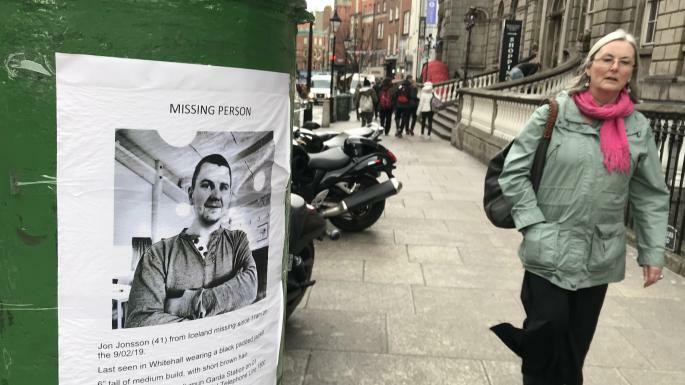 So far, the Irish press and gambling media outlets on the Web have provided exhaustive coverage of the poker player's disappearance. In 2008, police employed the help of gambling news sites, including Gambling911, in an effort to locate murder suspect Ernie Scherer III. The Aameda, California sheriff's office at the time suspected Scherer might be attending an upcoming poker tournament in Las Vegas. Scherer, a professional poker player, was ultimately arrested and sentenced to life in the brutal murder of both his parents. Stories appearing on the Internet led to individuals who had previous odd encounters with Scherer, including past girlfriends, far beyond where the crime occurred. So far, police in Dublin see no evidence of foul play in the disappearance of Jonsson. His family members insist the poke player was under no dirress at the time he went missing. Earlier this month, Jonsson's mum, Hanna Bjork Thrastardottir, told Virgin Media News: "It's the hardest thing I've ever been through in my life. "I could never imagine anything worse than not knowing where your child is, it's the worst thing. "We are checking all possibilities, when you have no idea where he is anything can happen. "So we just take it from there, the only thing is we have to do is find him, and we take it from there." Anyone with information regarding Jonsson's is asked to contact Ballymun Garda Station at 01 6664400, the Garda Confidential Telephone Line at 1800 666 111, or any garda station.